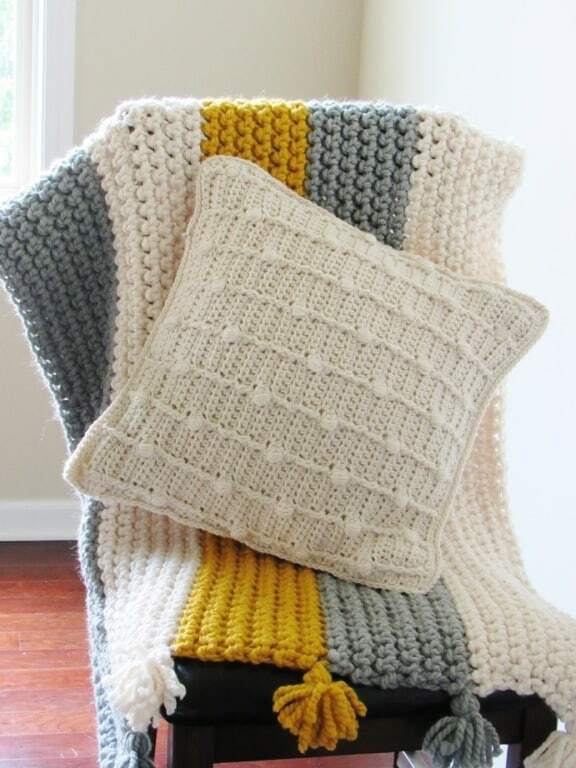 I designed this crochet textured throw pillow for my new home and I would love to share the pattern with you. I have been busy getting settled in the new place and I haven’t found time to blog much lately. 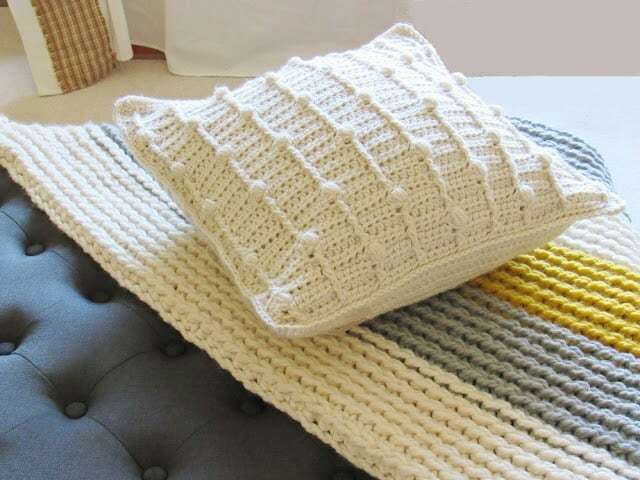 Texture is the new trend for Home Decor in 2018 and this crochet pillow pattern with bobbles and post stitches fits the trend to a T. This pattern is for a throw pillow case which can be washed. If you like to make it a throw pillow, all you have to do is opt not to make the opening. 1. Worsted weight yarn. Caron One Pound in Off-white was used for the sample. 1. Front Post Half Double Crochet (fphdc) and Front Post Single Crochet (fpsc): It is worked like a regular hdc or sc stitch except for the way you insert your hook. 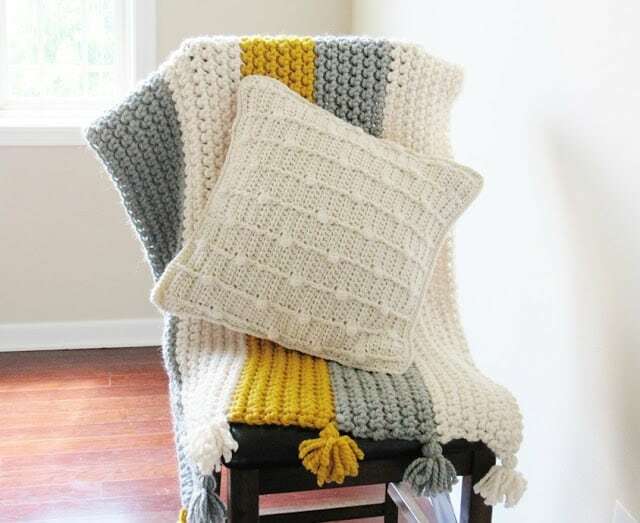 You can see a tutorial on front post double crochet stitches here, the hook is inserted in the same way for all post stitches: Front Post Double Crochet Tutorial. 2. Bobble: *(YO, insert your hook into the next st and pull up a loop)5 times, yarn over and pull through all the loops on your hook, ch 1 to close. The beginning chain is a multiple of 6 + 7. Row 3: Ch 1, 1 hdc in same st, 1 hdc in next st, bphdc in next fphdc st, *(1 hdc in next 5 sts, 1 bphdc in next fphdc), repeat from * until 2 sts are left, 1 hdc in last 2 sts, turn. Row 4: Ch 1, 1 sc in same st, 1 sc in next, fpsc in next fphdc, *(1 sc in next 5 sts, 1 bobble in next st on top of fphdc, 1 sc in next 5 sts, 1fpsc in next fphdc), repeat until 2 sts left, 1 sc in last 2 sts, turn. Note: You will have to push the bobble to the front or make sure it is in front when you make the sc following it. The ch 1 on top of the bobble is not a st and it is skipped when working the next row. Row 5: Ch 1, 1 hdc in same st, 1 hdc in next, 1 bphdc in next fpsc, *(1 hdc in next 5 sts, 1 hdc on top of the bobble, 1 hdc in next 5 sts, 1 bphdc in next fpsc st), repeat from * until 2 sts left, 1 hdc in last 2 sts, turn. Row 6: 1 hdc in same st, 1 hdc in next, fphdc in next fphdc, (1hdc in next 5 sts, 1 fphdc in st on top of bobble, 1 hdc in next 5 sts, 1 fphdc in next fphdc), repeat from * until 2 sts left, 1 hdc in last 2 sts, turn. Row 7: Ch 1, 1 hdc in same st, 1 hdc in next, bphdc in next fphdc, *(1 hdc in next 5 sts, bphdc in next fhphdc), repeat from * until 2 sts left, 1 hdc in last 2 sts, turn. Row 8: Ch 1, 1 sc in same st, 1 sc in next, bobble on top of next fphdc, *(1 sc in next 5 sts, 1 fpsc in next fphdc, 1 sc in next 5 sts, 1 bobble on top of next fphdc), repeat until 2 sts left, 1 sc in last 2 sts, turn. Row 9: Ch 1, 1 hdc in same, 1 hdc in next, 1 hdc on top of bobble, *(1 hdc in next 5 sts, 1 bphdc in next fpsc, 1 hdc in next 5 sts, 1 hdc on top of bobble), repeat from * to last 2 sts, 1 hdc in last 2, turn. Row 10: Ch 1, 1 hdc in same st, 1 hdc in next st, 1 fphdc in next st on top of bobble, *(1 hdc in next 5 sts, 1 fphdc in next fphdc, 1 hdc in next 5 sts, 1 fphdc in next st on top of bobble), repeat from * to last 2 sts, 1 hdc in last 2, turn. Row 11: Ch 1, 1 hdc in same st, 1 hdc in next st, bphdc in next fphdc, *(1 hdc in next 5 sts, bphdc in next fphdc), repeat to lst 2 sts, 1 hdc in last 2, turn. Repeat Rows 4-11 until your front panel is a 16-inch square. Fasten off and weave in the ends. Two back panels are worked, one with buttonholes and one with a button band to sew on the buttons. Repeat Row 2 until your work measures 8 inches. Row 4: Ch 1, 1 sc in same st as ch 1, 1 sc in next 10 st, ch 3, skip 3 st, 1sc in next 11 st, ch 3, skip 3 st, 1 sc in next 11 st, ch 3, skip 3 st, 1 sc in next 11 st. Turn. Rows 6 &7: Ch 1, 1 sc in same st as ch 1, 1 sc in each st across. Turn. Fasten off at the end of Row 7 and weave in the ends. Row 2: Ch 2 ( does not count as a hdc), 1 hdc in each st across. Turn. Keep the textured front panel wrong side up. Take the two back panels, Overlap the buttonhole band over the button band of the second panel and keep it over the front panel. Work a round of sc all around the cover distributing the stitches as uniformly as possible on the row ends. Sew on the buttons corresponding to the buttonholes.